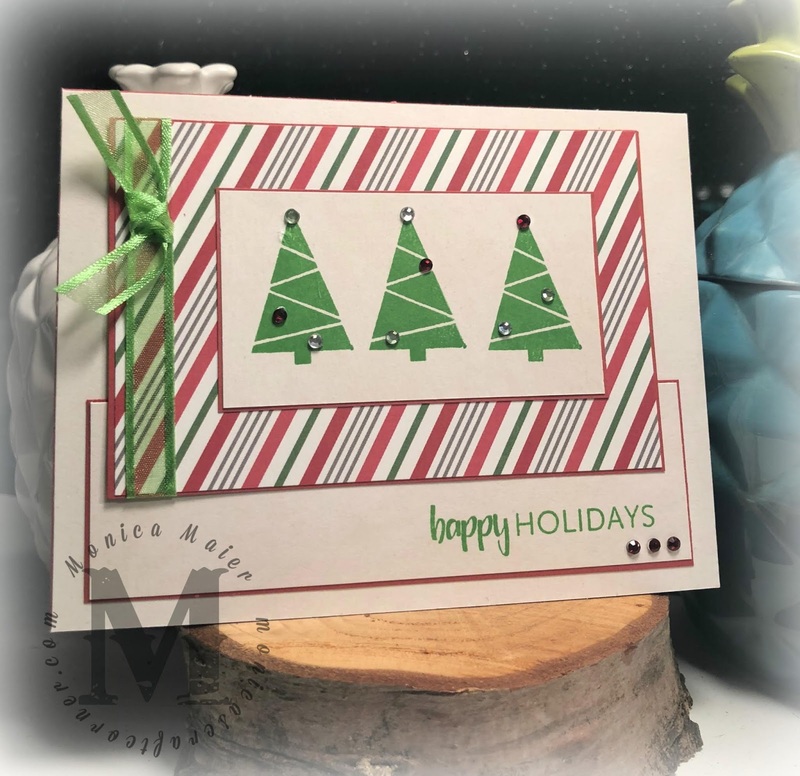 Today's card is a Holiday card for Addicted to Stamps and More's holiday theme challenge. To see what the rest of the DT has came up with this time check out the blog here! The card was simple I knew I wanted to use some Catherine Pooler's Foundation Box (Retired, but I'll link what I can), but wasn't sure how I wanted to pull it together. I found a sketch I liked and rolled with it. I'm pleased with the way it turned out. Love it when I start getting my Holiday cards going early! Don't forget to stop by the blog and play with this weeks Holiday challenge, I can't wait to see what you share with us. Thanks as always for stopping by! Feel free to leave a comment and follow the blog for updates with new posts! 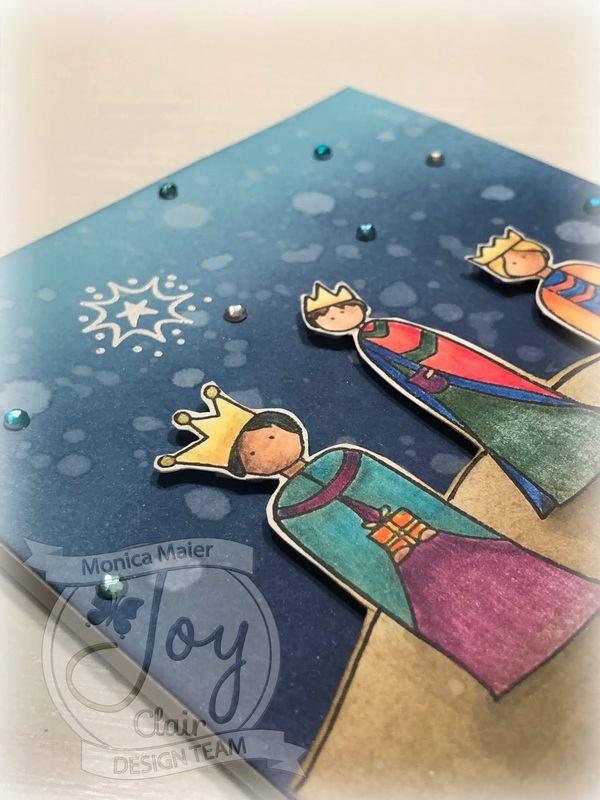 This week at Joy Clair we are doing a little Christmas in July theme. The team has been posting some wonderful Christmas creations. Today it's Helen and my turn... here is a look at my card. Please stop by the Joy Clair blog post to see the details on this card. The front of the card is only half, because I wanted the octopus to hover over the inside, where I have the smaller fish die cut to show the cardstock color. Don't forget to stop by the blog and play with this weeks anything goes challenge, I can't wait to see what you share with us. Thanks as always for stopping by! Feel free to leave a comment and follow the blog for updates with new posts! Hello everyone, today is my first post with Stick it Down! I'm so excited to be apart of the team and to work with the sketches. If you haven't heard of or played with the challenge before they not only have a card sketch, but sketches for scrapping as well. they have a single page and double page sketch as well. Visit the post here to see all the sketches. 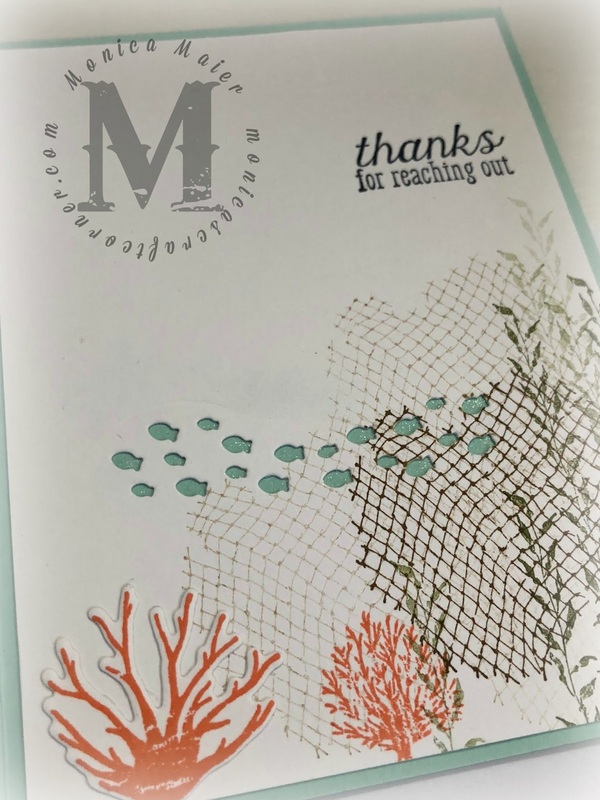 Here is this months card sketch by Laura Rumble. I picked my colors of cardstock to trim down to size. I adhered them to a piece of copy paper to keep them together. 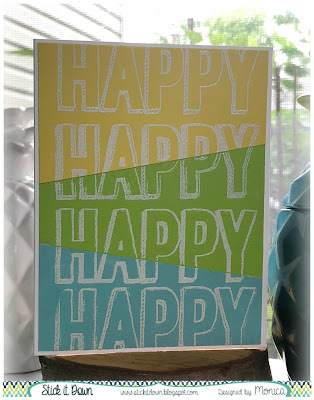 Then used my Misti to stamp the sentiment repeatedly and then heat embossed. 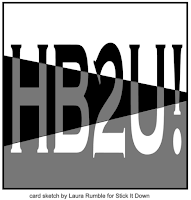 Thanks for stopping by, please leave a comment or follow me for blog updates! Hope to see you play along with Stick It Down. Have a great day! 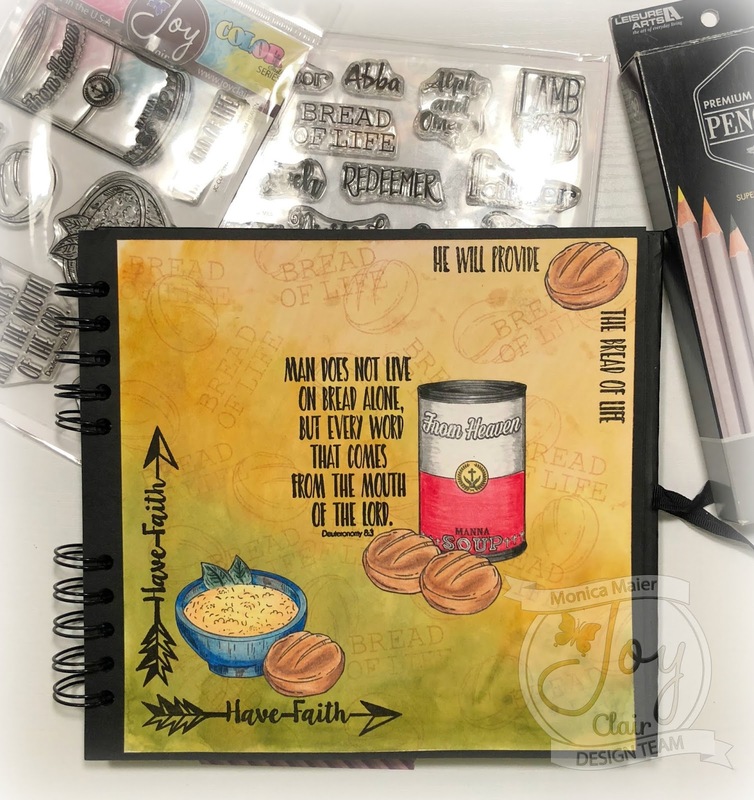 Today I made an art journal page for Joy Clair, visit the blog here to see all the details and how the page came together! Today's card is for Addicted to Stamps and More, we are working on Clean and Simple. 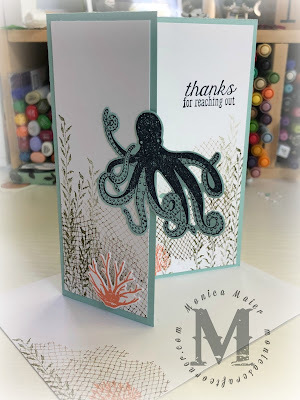 My card is a little more busy than my usual clean and simple, but I included it for this challenge since it was pretty simple to make. 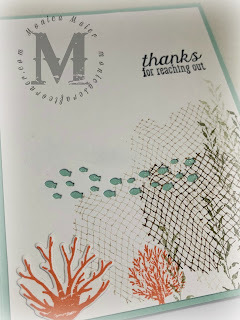 I used my MISTI to stamp everything, except for the image (it's a wood stamp). I made 10 of these... you can see some of the others peeking out from the bottom of the top card. 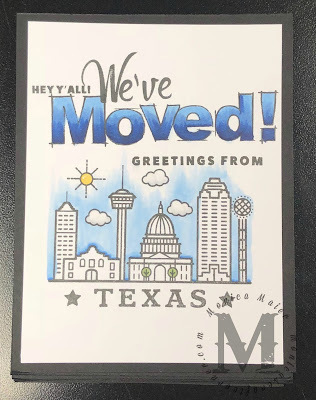 They are a going away gift for my folks who are moving back to Texas, I thought they could use them to send their new address.Before adhering the panels to the cardbase, I added some color with Copics keeping the coloring simple. Today's card is my take on the challenge over at Joy Clair blog for the month of July, please stop by the blog to play along and see the DT's inspired projects! 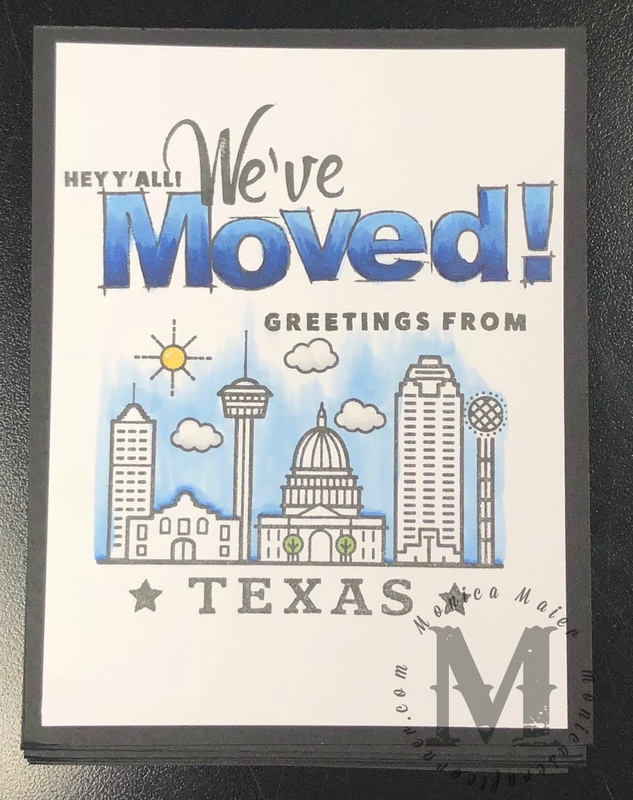 I started my card by adding some glitter in shades of blue and white to create my background. 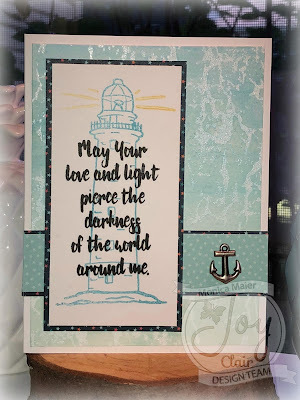 I then stamped, colored and fussy cut the ship from Light House. I die cut a circle to create a window and laid it over the glitter background. 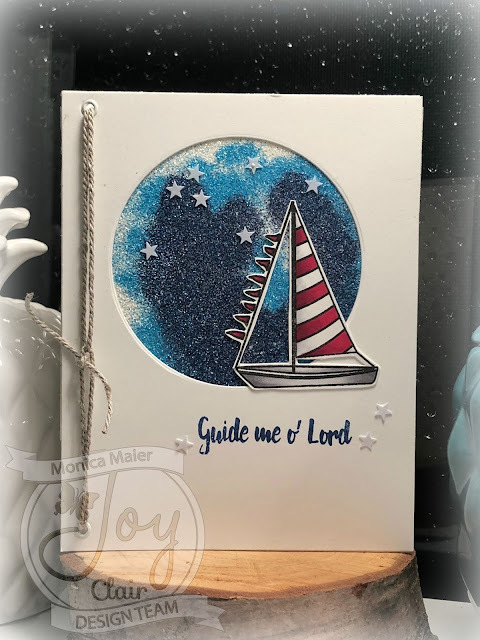 After I adhered the boat, I stamped the sentiment and added some white stars on the glitter background and sentiment areas.